From the moment I walked into Tark’s Grill I knew that this is the “spot” to be seen. It generates an air of the old boy network, a place where the men, not guys, go to talk deals and women lunch. 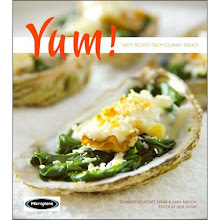 The traditional menu is reflective of dishes we all know well with salutes to local seafood and aged beef. You will find I often meet friends for lunch – a small freedom that comes with being self-employed. This experience did not differ; I met Maggie Moseley-Farley, sales representative for Style Magazine, for an enjoyable luncheon updating local restaurant news and family stories. Before Maggie arrived I ran into Mark Hofmann, manager of Tark’s Grill and genuine nice guy. I’ve known Mark for a number of years from his early chef days at Due, where he taught a cooking class for my Epicurean Club of Maryland students to Henry’s Bistro out at four corners in Jarrettsville where he purchased spices from my then employer, Vanns Spices. He agreed that what I had heard about their bar getting crowded once offices shut down for the day was correct and also recommends reservations for the dining room. Once Maggie arrives we are seated. The menu is pretty traditional, not too many items that you wouldn’t have seen on a menu 10 years ago. 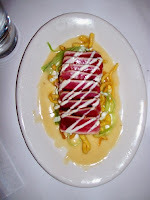 One of the exceptions is the Seared Rare Ahi Tuna appetizer ($10.95) we shared and it was YUMMY; the tuna topped refreshing cucumber spaghetti, crisp Asian noodles with an oriental flavored beurre blanc (butter sauce). Maggie and I decided to share a shrimp salad sandwich ($13.25), (from an earlier post some of you already know I am a shrimp salad snob), and the recommended crab cake sandwich ($14.95). 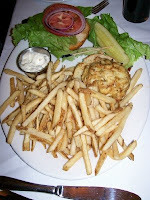 Maggie considers herself a “bread aficionado” and was in love with the roll on the crab cake sandwich. The shrimp salad oozed large steamed shrimp perfectly cooked in my estimation but lacked the Old Bay Seasoning I personally prefer. The requested rye bread for the shrimp salad didn’t quite hit the mark for Maggie and me. Our waiter was attentive but not overbearing and definitely had the finesse of a fine dining server. When probed, he stated that he also works at Ruth Chris in Pikesville. He saw me photographing the appetizer and reminded me to snap a shot of our lunch entrees. There was only one minor service misstep and that was the lack of flatware with our dessert. Dessert was the old-fashioned chocolate layer cake ($7.95) which was moist, not too sweet and plenty for two to share. The dessert menu was nothing new wave; apple pie, carrot cake, lemon tart, key lime pie, coconut pound cake, sugarless New York cheese cake, fruit sorbets and ice cream – the sugarless offering is a nice touch. 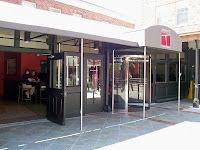 Before I forget, Mark did advise they will be making menu changes in the near future which you can review any time at their website at http://www.tarksgrill.com/. 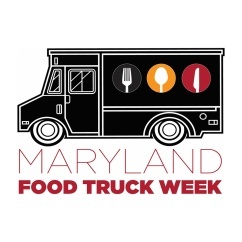 Mon-Thur 11:30 a.m. to 11 p.m.
Fri-Sat 11:30 a.m. – 12 a.m.
Sun 10 a.m. to 9 p.m.